"Wow genius idea! Wwf hasbro figures with Motu heads, with some silver paint slapped on. So is that what 'Art toys' are all about? Lame. Easy pass." [sic] - I heard comments like this a couple of times now. The funny thing is, I never said I was doing "art". And I'd never call myself an artist. I'm just some toy enthusiast who found out that MotU heads look fantastic on WWF Hasbro bodies. Especially when painted in minimalistic color schemes. If this is called "art" or "not art" - I don't care! All I care about is to do the things I love. And if others are digging what comes out of this, I'm even more encouraged to do it! Regardless of what terms they might use to describe this. In the beginning, I just did these figures for myself btw. Because I thought it was a fun idea, and these customs simply looked cool on display along with my MotU and WWF collection. Then fans started to message me. They said they liked what I was doing and asked if I was gonna release these figures, so they could pick some up. I said, OK - why not. Lemme do a few more of them. 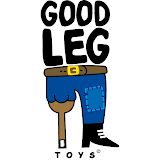 Or even better, lemme and my buddy Pablo from Goodleg Toys give you a whole selection of figures, both as custom and recast releases! This is how the idea of Wrestlers of the Universe (WotU) was born about a month ago. The idea did quite a development in the past weeks. We're planning to release the first series of WotU recasts early in 2013. Among them will be Dead DieBia$e, Warhoard, Greg "The Spike" Supercrime, and The Razor Beast. Every figure has its own story and will be released in various color schemes. The first series will be released bagged with a header art by Ralph Niese, creator of the legendary OMFG Phantom Shithouse. Today, the first run of strictly limited "Custom Edition" WotU's is dropping. They will also come bagged with a header artwork by Ralph. Besides the figures named above, that will also be released as recasts next year, there'll be a few one-off customs up for sale tonight! These figures are unique, and there won't be any further releases. I'm planning to do a few more runs of custom releases here and there, though. The store will open at midnight (GMT+1:00, German time). The URL is http://goodlegtoys.storenvy.com. Last but not least I wanna say THANK YOU to all the amazing fans out there, who've been supporting this little project enthusiastically right from the start. You are the true cause, guys, that keeps people like me going. THANKS! Oh, and don't forget to follow with our War on Prehis toyline, peeps! These figures will be dropping in 2013, as well! Dead Diebia$e - Underestimated because of his size, Dead realized quickly what money can buy! He's the master of cunning corruption and dirty fights. His mission: to become the ultimate WotU Champion one day. Greg "The Spike" Supercrime - Before Greg became a professional wrestler, he had worked as drug dealer, pimp, burglar, and car thief. He likes the quick and dirty money. During his career as a criminal he developed some very unique fighting skills, using his spiked head like a giant club to smash his opponents. Sometimes he teams up with his partner in crime Dead DieBia$e to leave a bloody mess in the arena. Warhoard - Warhoard is a highly decorated General and war veteran. After retiring from the army, he started his professional wrestling career merely as a hobby, "to kill some time". For his age he's in extremely good shape. Opponents fear his perseverance and lack of scruples in battle. His arch enemy is the Wrestling Enforcer. This haven't changed since the Great War of the Galaxies, where they faced each other in battle for the first time. The Razor Beast - The Razor Beast's fighting technique is as sharp as his teeth. He's a wild animal, born and raised on the rotten slum planet "Deadend". Survival there is a daily battle. To escape that shithole you actually need to be one of diehardest mofos in the universe! The Razor Beast definitely is.